I reveal My secrets to those who fear Me. The friendship of Yahweh is with those who fear him. King David is the author of this psalm. 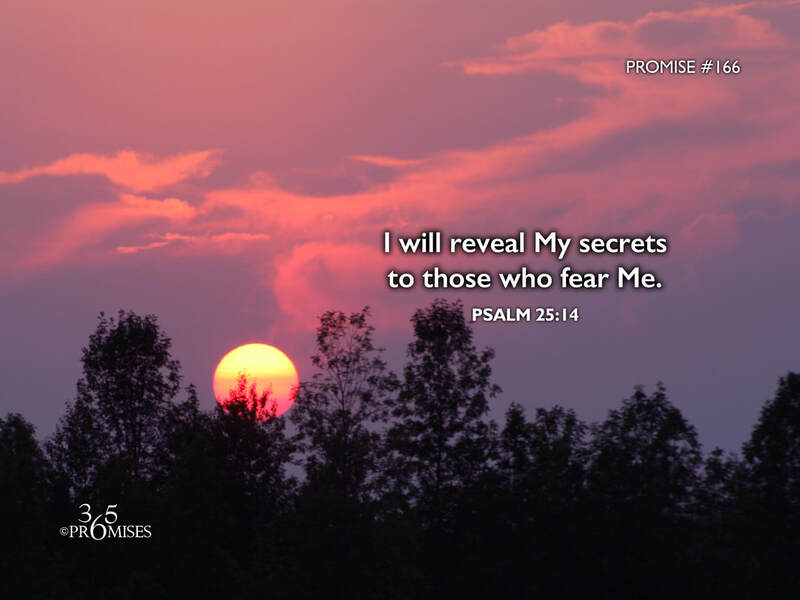 Today's promise talks about how God shares His secrets with those who fear Him. It is important that we know that the word 'fear' isn't intended to mean that we are afraid of God, rather that we revere Him and deeply respect His awesome power. This promise paints a very intimate picture for me. I imagine a father taking time out of his busy day to put his arm around one of his little ones to share a secret with them. After making sure no one else is around to hear their conversation, he whispers something so quietly that no one else can hear them talk. Isn't it amazing to think that our God and Father wants to share His secrets with us? Doesn't it blow your mind to think that we are friends of God? I am convinced that the Lord is always looking for those whom He can share His heart with. When I think of this promise and God's desire to share His secrets with ME, I am humbled by the thought. My prayer is that we will be able to quiet ourselves from all the distractions and noise of the day so that we might hear the gentle whispers of our Father's voice as He confides in us.